Inspired by my editor Anna's blog, I took a tasteful photo of my breakfast table yesterday. Actually, this isn't true. I was inspired by the flowers I'd picked from the garden, which sadly you can't smell - maybe one day scents will be possible on the internet. 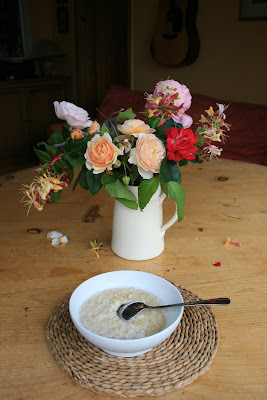 I cleared the table in the dining room ( I usually eat in the kitchen) and had the flowers and my porridge on the table and nothing else. Doesn't it look like one of those tasteful photographs you get in Country Living? 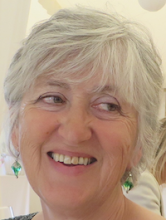 When I see those photographs I always think - why can't I live like that? Yesterday afternoon we were given some secondhand books by a friend. 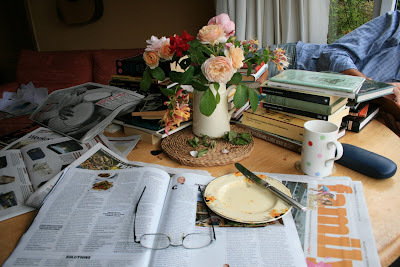 This is what my breakfast table looked like this morning, complete with the Saturday papers. This is my life. I'd sooner live amongst the books and newspapers. Print is good! I like both of those photos!